“Simplify it” was the brief the BackupAssist team were given to work with for version 7 and those of you who’ve been following our preview posts will already know that’s exactly what they’ve managed to achieve. 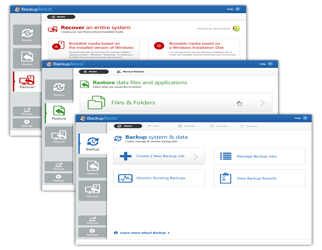 I’m pleased to be letting you know the latest major release of the fantastic BackupAssist software is now available for download from our site. “What’s new in version 7?” video here. Perhaps the most noticeable change in version 7 is a visual one, and that’s the completely new user interface design. This much simplified update focuses on the key tasks you’re likely to want to perform and job creation wizards have been re-designed to help provide that extra level of hand-holding so it’s even easier to put together a reliable backup strategy in line with what you’re after.. Along with some fantastic changes to how the software looks and feels, new in version 7 is the first iteration of BackupAssist’s centralised control capabilities. Building on the Centralised Monitoring Console you may already be familiar with, there’s now also a place for viewing all of your jobs in real-time within BackupAssist itself, with the ability to start, stop and disable jobs. Further still, if you’ve got multiple machines on the same LAN, you’re also able to open a remote console session to gain full access to configure and control a remote BackupAssist installation, all without the need to purchase or install any additional software. BackupAssist v7 also fully supports Windows imaging jobs on Windows Server 2012 along with Windows 8 platforms making it an ideal choice for new server deployments. 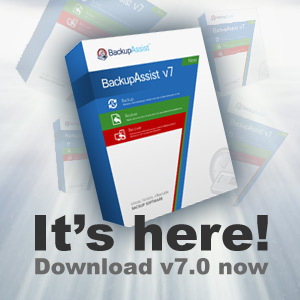 For a full comparison between BackupAssist v6 and v7, this link will take you to a PDF document from BackupAssist. For all the info on the new release please visit this link.